Hello, and welcome back, crafty friends! Today I am sharing a fun, summer card I made using a mixture of old and new supplies. I got really creative using tools from my stash in atypical ways since I didn’t have certain elements I needed to create this beachy scene. You can purchase any of the supplies I used on this card by clicking on the links at the bottom of this post. And don’t forget to use discount code TLPTLAURA10 for 10% off your goodies! We really do have a lot to cover today so let’s get started. Fun Fact: I heart bunnies. So of course I just had to have the Honey Bee Blah Bunny Stamp as soon as The Little Paper Tree had it available. Waiting for inspiration to hit, I kept it right on the top of my desk and kept looking at it. Meanwhile, we got a wonderful burst of Summer here in Ireland and the shops were raided of all sunscreen, fans, and kiddie pools. #WeveAllGoneMad! That’s when I realised my little Blah Bunny could be passed out from a tough day “adulting” on the beach. So the first thing I did is look through supplies from my stash that would create the perfect beach scene. 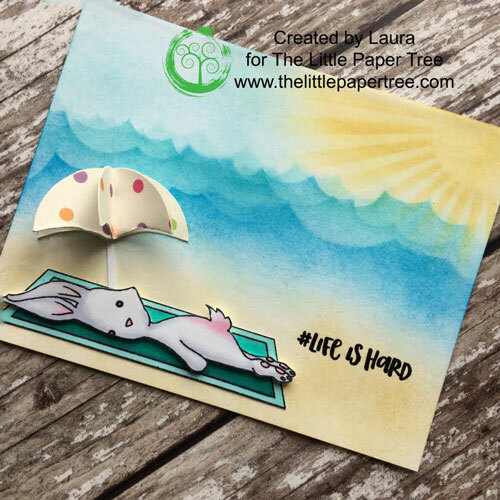 In addition to the Blah Bunny stamp, I came up with a cloud stencil, a sun ray stencil, a circle die and some creative cutting to pull it all together. I tell you guys this almost every time, but this time it is super important: make a test panel on a piece of copy paper to make the colour blends work and that everything will actually fit. There is quite a lot going on in this a2 sized card! Starting with the background, I cut a piece of Neenah Solar White to 4.25” x 5.5”. Then I grabbed a stencil that has definitely earned its money! I use it allthe time. It’s actually a cloud stencil from My Favorite Things but I turned it upside down to create wave lines instead. This particular stencil is pretty cool in that it has four sides, each with a different cloud (or wave) line on each side. This means you can create realistic sky and ocean scenes in just a matter of minutes. I started about half-way down the panel blending my lightest colour, Peacock Feathers, onto the panel using Nuvo Blending Brushes. I love working with these brushes because you can really control how much ink coverage you want as it goes on lighter than the traditional ink blenders.For this first wave line I went back and forth over it a few times for a medium amount of coverage. Then I turned to a different side and moved a bit up from the first wave line. For this wave line, I gave it a just light dusting so it would look like it is farther off in the distance. Then, I grabbed Mermaid Lagoon Distress Ink, rotated my stencil, and moved it below my original wave line. I gave it a few passes for a decent cover, then switched to Salty Ocean and repeated the same process moving downward. I purposefully chose to keep it somewhat “splotchy” with the Salty Ocean at the very bottom (of the ocean) so that I could have a rough blend with the sand (a.k.a. Antique Linen Distress Ink). By not blending it too much it left a bit of white to mimic the ocean spray on the shoreline. Last, I moved my stencil back up and created another wave line with Mermaid Lagoon, creating a smoother blend with Salty Ocean. Then repeated the process creating a new wave line higher up using Peacock Feathers. With the ocean done, I moved on to creating the sky. First I placed the Radiating Rays Stencil from My Favorite Things in the top right corner of my panel (if you don’t have this exact stencil, Sun Ray Stencil by My Favorite Things or Sunburst Layering Stencil by Honey Bee would work just as well!) I held my stencil down (with my hand) where I thought it looked best and used Wild Honey Distress Ink along with my Nuvo Blending Brushes to create sun rays. I lifted the stencil and lightly went over the whole sun area with Scattered Straw Distress Ink to fill in the white areas. For the sky, I used Tumbled Glass Distress Ink, being extra careful not to blend it into the yellows too much in case it turned green! As I said before, I used a light dusting of Antique Linen Distress Ink to create the sand. I intentionally left bits of white in some areas, and gave more ink coverage to other areas to create shadows and reflective spots that sand gives off in real life. I also put just a smidge of Pumpkin Pie Ink from Hero Arts in some places to create even more depth. I made sure the bottom area I just covered with ink was completely dry and used my powder tool to prep my panel for the sentiment I used from the coordinating Honey Bee Blah Blah Blah stamp set. I heat embossed using Versafine Onyx Black Ink and Ranger Super Fine Clear Embossing Powder to give it a bit of an extra pop. I stamped the Blah Bunny and his “beach towel” with Memento Ink in Tuxedo black as I planned to use Copic Sketch markers to colour my images. I just used a few cool greys and pinks for the bunny, and blue-greens for the towel. For the exact colours used, see the detailed supply list below. For the umbrella, there was a bit of imagination and a lot of trial and error involved in making it. I didn’t have an umbrella stencil or die that was the right size to shade my sunny bunny so I turned to my stash to see what I had that could become an umbrella with a bit of tweaking. Using some copy paper to practice with, I got out some nesting circle dies and cut out two circles of the same size. I folded them in half, then in half again. I unfolded them (completely) and cut in half to create four half-circles. I took each half circle, re-folded them (in half) again before gluing them together until all four half-circles were attached. Be sure to leave each end unattached as this will become the back (of the umbrella) that is glued to the panel. One final detail to really give it that umbrella shape involved just a wee bit of creative cutting. I folded the glued-together half-circles so they were stacked on top of each other, and cut an arc from the bottom, inner corner to the bottom, outercorner (see photo below.) After you cut it and its unfolded and opened up again, it creates that arc that umbrellas have. Now that I had a prototype, I repeated the same process with a fun polka-dot paper I had in my stash. To create the umbrella pole, I simply cut out a thin strip from white card and glued down directly to the card panel with Tombow Mono Multi Liquid Glue. I also glued the umbrella and beach towel directly to the panel. I popped my sunny bunny up with 3M Foam Adhesive. Last, I created a card base from Neenah Solar white and Fiskar’s 12” Trimmer, and glued my finished panel onto it. And that’s it, folks! By pairing new and old products together, I was able to stretch my hard earned money AND the creative side of my brain in the process. 😊I find it fun to come up with a concept of what I wantto create from a new item, then find items I already own to supplement it and make that happen. I hope you found a bit of inspiration to go diving into your stash to see what ways you can get even more out of supplies you already own.